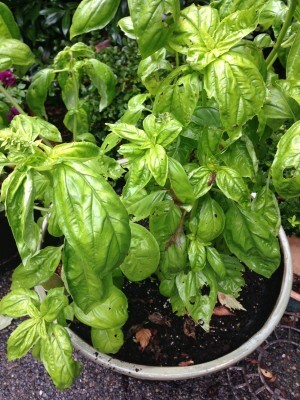 Whether or not we want to believe it, fall arrived and our summer basil is ready to bid adieu. I typically grow basil from seed each year but never got around to it this past summer due to our move. Luckily, I had some friends over for a barbeque and my friend, Hillary, brought the ingredients for this delicious nectarine caprese salad. She decided to bring a potted basil plant from Trader Joes because it was cheaper than buying basil at the grocery store. Once she pulled the leaves she needed for her salad, I asked if I could just plant the basil at my house. She gave me the go ahead and that little plant provided me with basil all summer long! Last weekend I decided that the basil was starting to look a little ragged and that it was time to make a batch of pesto. The leaves were starting to get eaten by little garden creatures and that would normally bug me if I was going to make something where the leaves needed to be in pretty condition. When it comes to making pesto, who really cares? The basil is about to meet up with the food processor so as long as the leaves are clean, you’re golden. Toast the pine-nuts in a skillet over medium heat until they are just golden and fragrant. Remove and let cool. Add the unpeeled garlic cloves to the skillet and toast until the color deepens slightly. Remove the cloves from the pan, let cool, then peel and chop the garlic. 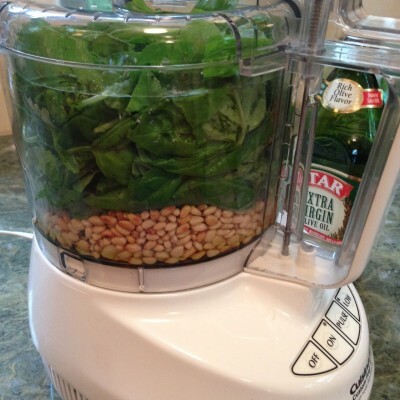 Add the nuts, basil, garlic, salt & pepper, and olive oil to the food processor. Pulse a few times and then scrape down the sides. I really pack my food processor so it requires a little help for it to all process smoothly. 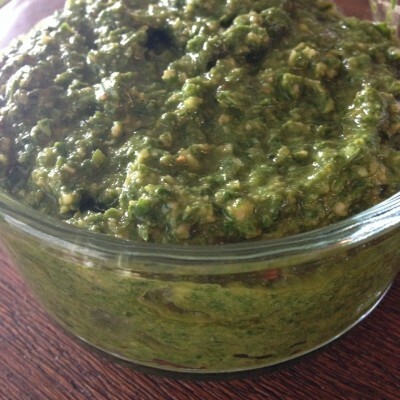 Once the pesto is processed to your liking, taste for seasoning. The pesto can be kept in an airtight container, covered with a thin layer of oil (1 to 2 tablespoons), and refrigerated for up to four days or frozen for up to one month. I let the pesto thaw on the counter and then warm it in a saucepan. My favorite use of pesto is making a pesto cream sauce so I rarely add the cheese directly to the pesto after it thaws. I will just add some parmesan to the sauce before I toss with fresh pasta. Yum! So take whatever basil you have left and whip up a batch of pesto before it’s too late!